Over the last 100 million years, native species shaped our ecosystems. Now, farmers bring in non-native honeybee hives by the truckload to pollinate hectares of non-native crops. And the honeybees could be affecting how native bees do their job. 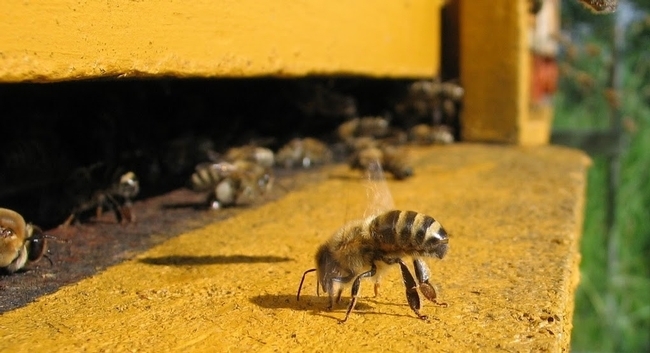 In a 2013 study, Lucas A. Garibaldi found that “overall, wild insects pollinated crops more effectively; an increase in wild insect visitation enhanced fruit set by twice as much as an equivalent increase in honeybee visitation.” But native bees face serious competition: Victoria Wojcik, research director for Pollinator Partnership, notes that honeybees could drive out native bees when the two compete for flowers. Volunteers have sent in photos and samples from all over the world. The survey currently has over 4,000 images, offering an up-close-and-personal encounter with our smallest flora and fauna. At this greatly enlarged scale, the bees look otherworldly. Their compound eyes are traced in striking patterns, and orbs of pollen delicately latch on to their surprisingly furry backsides. This small selection of bees from the American West demonstrates an immense, previously unseen diversity and shows viewers there's a lot more to the story of bees than just honeybee hives. Avocado is a neotropic tree which has been commercialized world-wide, yet it's native pollinators have been little studied. 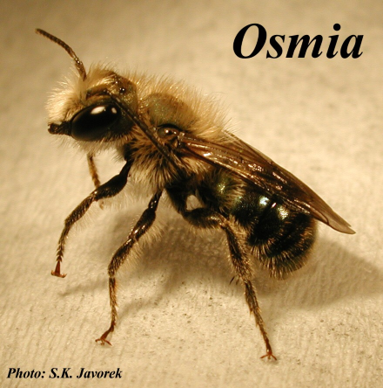 The most frequently studied pollinator has been the old-world insect, Apis mellifera. 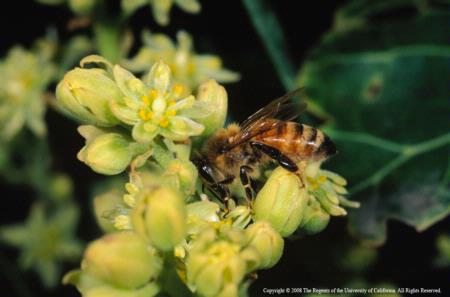 In commercial orchards it is common practice to introduce honey bee colonies, although it is not clear exactly what the extent of their effect is in California orchards in the presents of native bees and other pollinators. The purpose of this study is to evaluate the range of avocado flower visitors and to assess whether those numbers can be affected by the introduction of gardens that might promote their numbers in the orchards during the avocado bloom period. Measuring pollinator performance is difficult because of weather impacts, alternate bearing habit and the high level of fruit shedding in avocado. In this study, pollination gardens have been established in three avocado orchards in coastal California near Santa Barbara, just north of Los Angeles. These gardens have been established since 2014 with a variety of perennials that can supply nectar and pollen over the year and especially during the prolonged flower season. The three orchards where the gardens are established each exceed 40 ha. Gardens have been established in just one portion of the orchards, so that flower visitation can be assessed near and far from the gardens. The individual visitation activity of flower visitors was evaluated per unit time and their abundance on avocado flowers near the gardens and away from the gardens. Visitation was also similarly assessed on the pollinator gardens. Pan traps were also used to assess the presence of native bees in the orchards. The most abundant visitors in all years have been Syrphid spp. along with a variety of other flies and wasps. The most abundant native bee species have included Ceratina, Halictus, Agapostemon and several andrenid species. The highest diversity and abundance of visitors has occurred after the high rainfall year of 2016/17 after previous drought years. Imagine going to the supermarket to stock up on groceries but coming home empty-handed because you just couldn't figure out how to work the shopping cart or figure out how to get to the ice cream tubs in the freezer aisle. Welcome to the life of a bumblebee. Gathering sweet nectar from flowers, it turns out, is much more difficult than one might think, and it requires a lengthy learning process. By the time a bee has figured out how to efficiently pry open the lips of a snapdragon flower, for example, most likely it has made dozens, if not hundreds, of floral visits. How does a bee in charge of shopping for food needed to raise dozens of hungry larvae back in the hive learn to navigate the multitude of floral architectures it may encounter during an average workday, let alone over the course of its life? Mostly by what biologists call associative learning, more widely known as trial and error, researchers have found. But while extensive research -- starting with famous bee researcher and Nobel laureate Karl von Frisch a century ago -- has focused on uncovering how bees forage for nectar, much less is known about how bees go about collecting pollen, which constitutes the most important protein source for the developing brood in the hive. 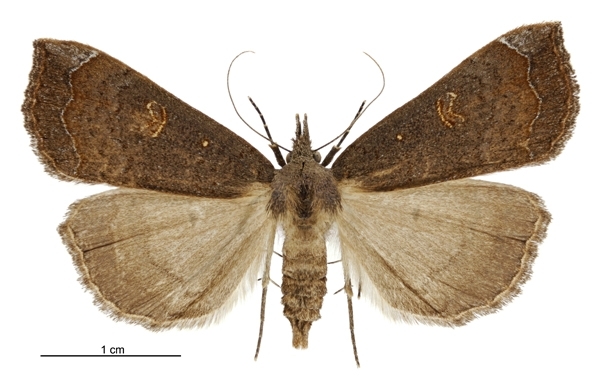 Avery Russell, Stephen Buchman and Daniel Papaj in the Department of Ecology and Evolutionary Biology at the University of Arizona decided to take a closer look. In a new paper published in the journal Behavioral Ecology, they tell a fascinating story of what is involved in a seemingly simple process of a bumblebee visiting a flower to gather pollen. And for the first time, they have untangled the subtle cues that a bee looks for when she visits a flower in search for pollen. "For a long time, we have known that bees can learn all kinds of cues -- tactile, visual and olfactory -- when going after nectar rewards," says Russell, the study's first author. "When you open a can, you have to use a can opener, then use your fingers to pry the lid open. A bee might have to pop open the flower's petals, and might have to try many times over multiple trips until they get good at it. But not much was known in the context of pollen rewards." Specifically, Russell and his co-authors wanted to know if bees need to learn in order to collect pollen efficiently from flowers that vary in their form. The research suggests they don't, and they don't need to. "Our findings suggest that unlike nectar foraging, which requires complex learning behavior, bumblebees already know how to collect pollen," says Russell, who did the research as a doctoral student in the UA's Graduate Interdisciplinary Program in Entomology and Insect Science, "and they do it by switching between two responses that are seemingly hardwired into their brains." Once a bumblebee touches down on a flower, it wastes no time. If it senses that the anthers are laden with abundant pollen just waiting to be shaken off like ripened apples from a tree, the bee does the obvious: a behavior that bee researchers call "scrabbling." Using its mandibles and legs, the bee brushes the pollen grains onto its body, then combs them off into collection baskets located on each of its hind legs. "If you picture a happy toddler in a play pit filled with plastic balls, you get the idea of scrabbling," Russell says. However, some flowers make their pollen grains more difficult to access, or sport intricate anther designs that dispense only a little bit of pollen at a time. "That way, the plant makes sure pollinators don't eat it all, but carry it to other flowers for pollination instead, and also leave some for other visitors as well, so the flowers aren't limited to a single pollinator," he says. When visiting some of these trickier flowers, Russell's team found, bumblebees switch to a different behavior called sonication -- or, in more familiar terms, buzzing. Not unlike a sonicating toothbrush that vibrates to shake plaque from teeth, a sonicating bee vibrates vigorously to free pollen grains hidden inside the flower. The team observed that the bees switched between these two motor regimes depending on chemical and mechanical cues: They scrabbled when pollen was abundant, and sonicated when pollen was scarce, either because the flower already had been depleted or because its pollen is less accessible by design. To tease apart the cues that trigger each behavior, the researchers made artificial flowers and treated some of them with chemical extracts from natural anthers. Bees visiting a surrogate flower without extract didn't stick around and took off again in search of more rewarding offerings. When they encountered a foam flower without pollen but with the chemical cue, they buzzed them in a futile attempt to harvest the nonexistent pollen. And when they sensed pollen grains, even artificial ones, scrabbling ensued. "Bumblebees tend to sonicate on pollen-concealing anthers right away, but they also buzz accessible anthers when they can't detect pollen by touch," Russell says. 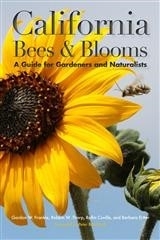 "We think they do that in an effort to collect the dregs from a flower after most of its pollen has been harvested." Being able to switch between two programmed routines allows bees to effectively collect pollen from flowers in many different shapes and forms, the researchers conclude. This flexibility also may explain a fact that had evolutionary biologists stumped for a long time: Flowers with concealed pollen stores evolved many times independently, suggesting that pollinators must always have had a way to harvest pollen from them, or else the co-evolution between the two would have led to a dead end and not survived. "Researchers used to think that floral sonication is a behavior only used to collect pollen from concealed pollen stores," Russell says, "but because we often observe bees buzzing on flowers with accessible pollen, we conclude that it's a behavior that has evolved as a general strategy to collect pollen from any type of flower." Presenting bumblebees with various combinations of natural and artificial flowers laced with chemical and mechanical cues, UA biologists have discovered that for a bumblebee, foraging for pollen versus nectar is very different. photo: honeybee on avocado flower. Is it buzzing or scrabbling?